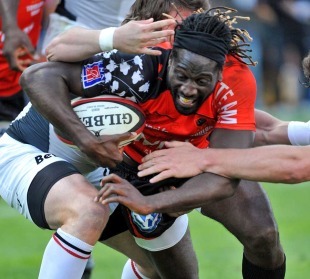 Former England wing Paul Sackey has been shown the door by Toulon after just one season in the Top 14. The 31-year-old has been replaced in the squad by Samoan winger David Smith, who is currently playing Super Rugby for the Western Force. The 24-year-old, formerly of the Hurricanes, has signed a two-year deal. "As he did not satisfy us, we have decided to release him," Toulon boss Mourad Boudjellal said of Sackey. Boudjellal also confirmed that coach Philippe Saint-Andre would keep his job despite failing to secure a play-off place in the Top 14. He will be aided next season by backs coach Pierre Mignoni, who retired from playing at the end of the season. "Saint-Andre will stay in his role, but he will have different people at his disposition," Boudjellal said. "It is my belief that we need to strengthen our coaching staff. Maybe there are certain people who should have new tasks, more suited to their limitations." The club will meet with Wales centre Gavin Henson in the coming days to decide his long-term future. The 29-year-old played three games at the tail-end of the season, doing enough to secure an international recall, but was also suspended for a week after an incident on a team night out.